Hello and welcome to my travel diary, Painting in China. Here I will take you on my trip through China this spring. I will start in Chengdu. 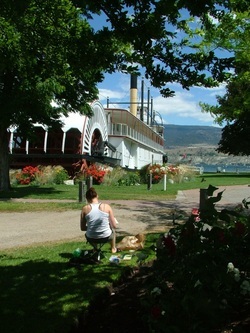 We will visit local sites and get inspired to create art. Please come along and enjoy the images. If you are so inclined please pick up a paint brush and join me! Please click on Travel Blog in the menu on the left to follow this wonderful journey. I first journeyed to paint in China way back in 1987. I travelled for a month all over the country and then went and studied with artists from the Central Academy of Fine Arts in Beijing. I then returned to paint in China in 2000 and 2002. My latest travels here were in Sept. 2010. You may read about some of these earlier trips at http://www.worldarttours.net/chinaarttours.html. 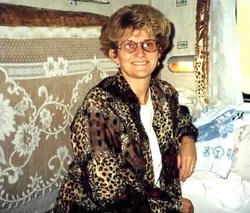 Angie Roth McIntosh on train to Guilin. 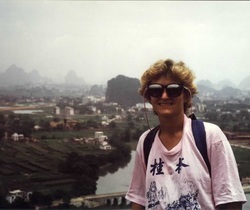 I journeyed to Guilin and Yangshuo as well as Suzhou and Zhouzhaung in 2000. I painted mountains, streams, gardens, and bridges. 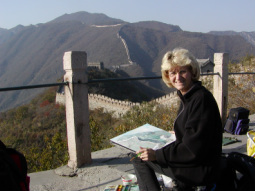 You may see my paintings of China at http://www.worldarttours.net/chinapaintings.html. Daughter Kelsey is in China to paint and to do her 4th Year Elementary Education Practicum. Kelsey is also an artist that enjoys painting in acrylics and has been a creativity camp leader for the Okanagan School of the Arts. You may follow her Journey Through China at her blog at www.EducationPracticums.weebly.com.